The FAST Wet Brush - Perfect For Detangling Long Hair. My daughter has long thick curly hair which is very hard to manage at times. When I heard about this Wet or Dry Detangling Brush From the Makers of F.A.S.T. Shampoo and had the opportunity to purchase it at a discount in exchange for my honest and unbiased review, I got it for her. It is a nice lavender purple color which happens to be one of her favorite colors so she immediately loved the look of it. The head is nice and large and the handle is very comfortable to hold because it has a rubberized grip that won't slip when wet. 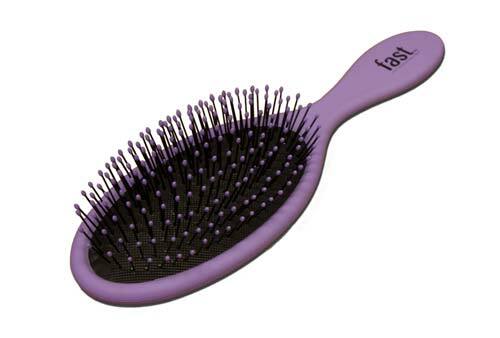 The bristles are solid plastic with rounded ends and are made in such a way that they do not pull or get stuck in the hair. She used when her hair was damp just out of the shower and it glided smoothly through it detangling without pulling it. When she tried it on dry hair it worked just as well.As a little added bonus, the company provided sample packets of their FAST shampoo and conditioner and their Nisim shampoo and conditioner which was a nice touch. Overall, my daughter is very pleased with her new hair brush and would recommend it. I started using "The Wet Brush" about a year ago on my waist length hair to help with all the tangles and eventual breakage and I can say I have seen a difference in my hair breakage. But more importantly, it's SO MUCH FASTER to brush through long hair. And in the few times I have had to use a "regular" brush, I get irrationally frustrated at how long it takes to get the tangles out and how much hair I lose in the process. So, I decided to get a spare brush for traveling. This brush fits the bill. It is probably a bit more stiff than my old brush, but the old one might be a bit "broken in" from use. Overall, it is the same size, quality, and the little bristle heads stay on to keep your scalp from getting scratched, so it's a good substitute. The pricing is about the same, but I was pleasantly surprised to receive FIVE (!) samples of shampoos/conditioners for my hair along with this brush. I was offered to try this product at a discount in exchange for an honest, unbiased review. I try to provide both positive and negative feedback on the products I try.